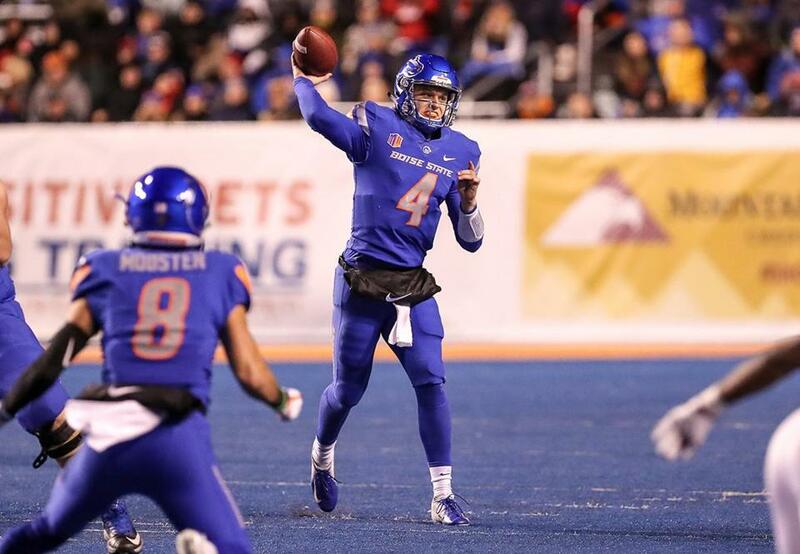 Brett Rypien is this year’s Mountain West Offensive Player of the Year. And he has a famous relative. Boise State has long outgrown the days when the blue turf of its home field mesmerized anyone who stumbled across one of its games on TV while channel surfing. The Broncos have been an elite program for nearly two decades. They are ranked 23rd this year and will make their 17th straight bowl appearance. They’ve won three Mountain West Conference titles since 2012, narrowly missing a fourth this season after falling to Fresno State in an icy overtime battle last Saturday. Pitting Boston College against Boise State in the First Responder Bowl Dec. 26 in Dallas may seem like odd matchmaking — ESPN was allowed to do some reshuffling — but the Broncos are a program with brand recognition, and they will pose some challenges for an Eagles team looking to finish the season with eight wins for the first time since 2009. 1. They, too, have one of the best running backs in the nation. His name is Alexander Mattison, and the junior has been a force for the Broncos the past two seasons. He broke out as a sophomore, piling up 1,086 yards and 12 touchdowns on 212 carries over 14 games. But he really shined this season, racking up 1,415 yards on 302 carries and leading the MWC with 17 rushing touchdowns. Mattison willed the Broncos to overtime against Fresno State in Saturday’s MWC title game, rushing for 200 yards and a touchdown on a school-record 40 carries, despite having to exit briefly in the fourth quarter after being dazed by a hit to the head. The 5-foot-11-inch, 211-pounder could pose problems for an Eagles defense that gave up 155.5 rushing yards per game and had seven players run for at least 100 yards on them. 2. Yes, quarterback Brett Rypien is related to Mark Rypien. Mark Rypien is the last quarterback to lead the Redskins to a Super Bowl, taking MVP honors 27 years ago in Super Bowl XXVI. Brett is his nephew. And even though he wasn’t born when his uncle reached the pinnacle, Brett calls him his biggest football influence. Brett grew up watching highlights of his uncle at Washington State and, at every level, Mark was a mentor. At Boise State, Brett carved out his own legacy. He’s the MWC all-time leader in passing yards (13,581) and completions (1,036) and was named the conference’s 2018 Offensive Player of the Year. 3. They come into the bowl with a bitter taste in their mouths. The Eagles may have lost three straight to end their season, but Boise State had the opportunity to win back-to-back MWC titles and let it slip away in overtime. The game was played in gnarly conditions, as ice made it impossible for Rypien to make plays. Losing at home only made it worse. 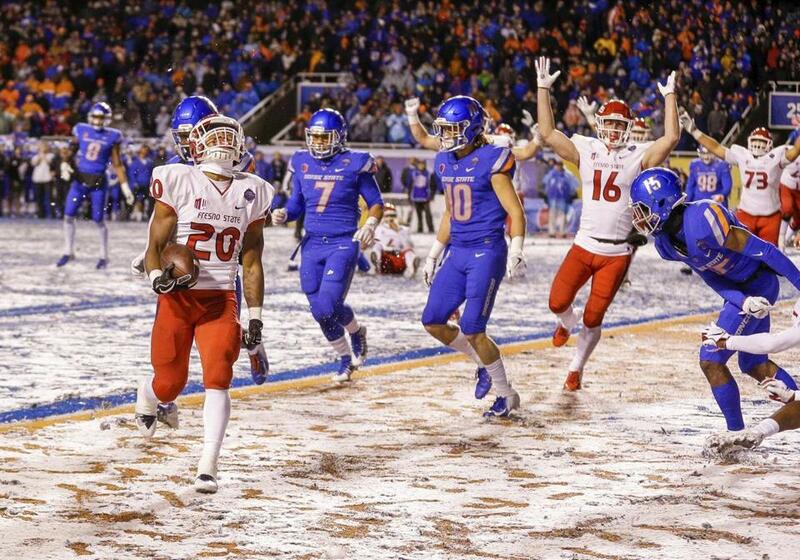 Fresno State’s Ronnie Rivers (left) scores in overtime to win the Mountain West championship game on Boise State’s home field. 4. Their streak of 17 straight bowl appearances is the fifth longest in the country. It started with a win over Iowa State in the 2002 Humanitarian Bowl. The most memorable one was probably the Fiesta Bowl on Jan. 1, 2007, when they ran the Statue of Liberty play to beat Oklahoma in overtime. They tried to reboot the signature moment last year in the Las Vegas Bowl and it ended pretty ugly. But they’re always willing to go for it. 5. The matchup against an ACC opponent is an obvious anomaly. Boise State has played ACC teams only four times in school history. They’re 2-2. They lost to BC in the MPC Computers Bowl in 2005. They’re 1-1 against Virginia and 1-0 against Virginia Tech. This matchup came together under unusual circumstances. Because there weren’t enough bowl-eligible teams from the Big Ten, Boise State was given an at-large spot, and the bowl was able to swap a Conference USA choice for an ACC choice and tapped BC.